Follow the below steps to create targeted plan in Primavera P3. 3. 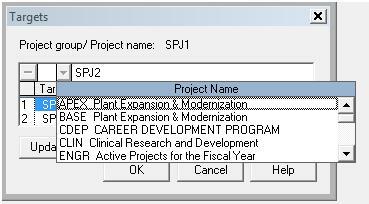 If you want to create a target plan using current project plan, Click the target column in Targets box and enter four digit project name (SPJ2) for the target project. Target project name must be different with project name (SPJ1). See figure below. 4. If you want to convert another project to a new target for the current project, select a project name from the drop down project name list. See below figure. 5. Click Ok to create the targeted plan. Repeat these steps to create a second target plan. In P3, you can create as many target projects as you want, but you can compare only two targeted schedule to the current one at any one time. You won’t be able to view the column for targeted plan until targeted plan is created. See below figure. Target plan data such as target 1 early start, target 1 early finish will be able to view after target plan is created. If budgeted quantity (Resource hours) and Budgeted cost are also available in your plan before target plan is assigned, you will be able to review current project status against the original plan. See figure below. Learn more about how to assign baseline schedule with Oracle Primavera P6(How to fix the problem – Baseline Changes with the Data Date changes in P6 ). I would add the same. Would you mind to share with us your thoughts about baselining in P6? Thanks your comment. I would love to share about it. Stay tuned for new post. Hi What if target project is not showing in the dropdown box.